Originally posted by Neil MacQueen at the old website. Updated. Most Rotation churches give their workshops creative names, and sometimes rename their entire Sunday School. For example, the 3rd grade's former classroom not only gets transformed into a "Video Workshop" with fun seating and atmosphere, but it might be renamed "HolyWord Studios," and the entire Sunday School might be renamed "Bible Trek." All our classrooms become transformed not only with creative teaching, but with creative decor and furnishings that stay up year-round. In the traditional model, the creative stuff was usually temporary or something you hung on a wall. We dressed up the place for VBS or a special Advent program, and then took it down. But in Rotation, our creative decor doesn't come down after the lesson, it takes its cue from the teaching medium to be used, and helps re-define the space, -and we continue to add to it. This "re-definining" often extends into the hallways, and into the renaming of the entire program. Many WoRM churches continue to call their program "Sunday School." And many WoRM churches merely call their art workshop, "The Art Workshop." But many WoRM churches have gone whole hog: renaming both their entire program and their workshops along the lines of a unifying visual theme. "Faith Forest," "Ark," "Promised Land," "Faith Trek," etc. And they thus name their workshops to follow the theme. For example, the Video Workshop in Faith Trek Rotation Sunday School might be named and decorated, "Moses' Mountaintop Theater." When you look at the murals painted in many Rotation Sunday Schools, they very often follow that sense of theme-ing. You can see an amazing list of names posted here. Here's a link to photos of workshops and signs. There's a nice location thread running through each, and each workshop can develop its own decor personality. And as you will see below in my list of "caveats," the above list generally avoids the cringes I experience when I hear some other names. The biggest design cues come from the TEACHING MEDIUM of the workshop. The typical Video Workshop will have comfortable seating and popcorn, and the typical Art Workshop will have lots of table space, color, and materials all over the place. Read Rotation.org's articles on Workshop techniques to get inspired by what kinds of "stuff" you might want to have at hand in the workshop. Taking design cues from the activities often means each workshop has a unique look, and that sometimes makes a 'unifying theme" or program name, a bit difficult to come up with. Don't get enamored with a 'big theme' before you think through your workshops. As people have shared their names over the years, I've had my favorites. To each their own! ...but here are some things to think about when deciding IF you want to rename your entire program, and what direction to go with theme-ing your workshops. Note: As one of the founders of the Rotation Model at the Barrington Church where Rotation first took off, ...we chose to give our workshops simple names, like, "The Art Workshop," and "A-V Workshop." We continued to call our program "Sunday School." That gave us great freedom in the early years to evolve our direction, and to make changes. And rather than ditch the name "Sunday School," we attempted to resurrect it with new enthusiastic meaning. "What sounds cool" is different every few years. Make sure you're letting your kids suggest names, and not simply reaching back into your OWN childhood! Bible themes, such as, "ark," and "net" tend to come in and out of favor. "Active" names, such as, "trek" and "discovery," tend to trend. Acronymns fall in and out of fashion, such as, "BLAST" for Bible learning adventure stations"
Not saying those are wrong, but if you're going to rebrand your Sunday School with a new name you want to stick, think carefully. "Kids Kingdom" probably has more heft and staying power than "Kids Caravan." Don't create a problems for your older kids. **This is the one problem I see more frequently than others. Some names sound "hokey" or have an uncool factor for older kids. Corollary: "Too cryptic" If you have to explain to a visitor what "C.H.R.I.S.T." stands for, and it sounds too convoluted, you're trying too hard. 3. Location and Space often affects theme-ing and naming. Unifying themes can come in handy when you're trying to transform a single bland hallway or wing, --but if your workshops are located around the building, then a unifying decor may be less achievable, and thus, less important. For example, if your Cooking Workshop is in the church kitchen, and your Computer lab is on the second floor, then visual unity is impossible, and having a unifying look to your workshops might be less achievable or important. Cooking and Computer workshops often don't need a lot of "decor" because their equipment is the star, and many cooking workshops utilize the church kitchen. But if your workshops are all next to each other in the children's wing, then you have some interesting theme possibilities. 4. Some overall themes can become strait-jackets. For example, if you theme your Sunday School after a "forest" --you can come up with some fun sounding workshops, but then each room has to take on some aspect of a forest. And your forest can become "your new beige." And what if 2 years later you want to turn one room into a beach themed space? Many Rotation churches find that they have good names and ideas for 2 workshops, but not for four under the tyranny of a specific theme, such as, "Ark." You might be better off with a BROAD THEME, such as, "outdoor spaces" rather than theme-ing your space narrowly as a "forest" or "sea." Better to stick with a broad "trek" or "journey" theme, than to narrowly theme all your workshops with a single story "Ark" theme, or "Galilee" theme. You'll simply have MORE OPTIONS and IDEAS and MATERIALS to choose from when you broadly theme your workshops and space. 5. Some themes can be more expensive than others for the entire Sunday School or a particular workshop. For example, its more labor intensive to theme your Games workshop as a location in "Jerusalem" vs making it look like a Bible study room with gameshow supplies. Temple murals and faux pillars take time and money. Update: I recently started redesigning a computer lab along the lines of a "beach" shack because beach-y items are everywhere and really cheap. 6. Some Workshop Names are so good they don't have to fit an overall theme. Computer workshops tend to be like that. Here's a sign from Elm Baptist in Bonner KS showing one of the most popular names for computer labs. 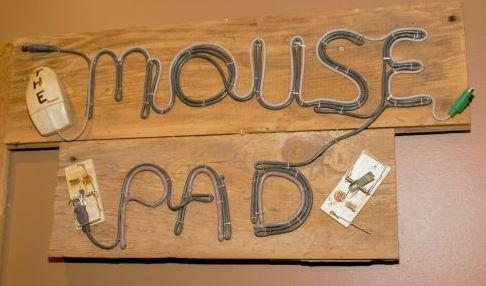 But more than just a name, they themed the room and signage to the name. Their workshops SIGNS were the unifying design element. And some workshops decor ideas are so good, they don't need to fit an overall theme or need a fancy name. 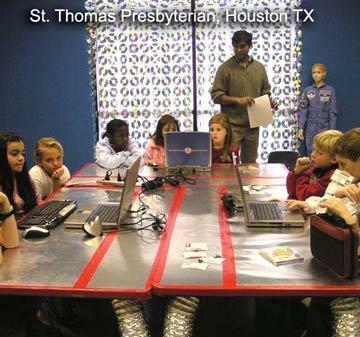 This church below designed their computer lab like a space ship because they were in Houston, the home of Mission Control. I've seen some great workshop names attached to some mediocre lessons over the years. I've also seen some photos of rooms that have a great SIGN announcing the name, but the room itself leaves a lot to be desired. If you're naming your Video/Theater "Moses' Mountaintop Theater" and it looks like the basement of the church, step back. My own PERSONAL preference is to keep the name "Sunday School" and transform people's PERCEPTION of it by the quality of our work. Then name and theme each workshop individually according to your overall needs, local inspirations, and great decor resources. For example, in one church where I've done rotation, we named our Video and Drama workshops the "Lion's Studio" in honor of the name of the old kid's group that we were retiring. Our "lion" became the mascot of the room and is featured on our sign and on a wall poster. My own experience tells me that my design ideas will change, and workshops will need freshened up every 2 or 3 years. If you do rename your Sunday School and workshops, PLEASE PROMISE ME THIS... That you will pick names and decor that will appeal to your OLDER KIDS. They are at that critical age where "uncool" can easily become "un-attended." See our list of member contributed Workshop and Rotation Model names. Ruth KearleyRotation.org Guru (300+ pts) a Supporting Member! I am at a small church where our church school attendance for grades 2-5 is usually no more than 10. We don't "rotate" between rooms, rather, we have a different workshop each Sunday in the room. When we began the Workshop Model of church school about 7 years ago, I was a stick-in-the-mud about giving a new name to the class. I wanted it to be imaginative but proper. The kids and one of the shepherds were much more free-wheeling, and the nickname they gave their new class is what stuck. We are the Coolios (because we are the *cool* Sunday school). I could not be happier that that is how the kids have felt about their church school class.